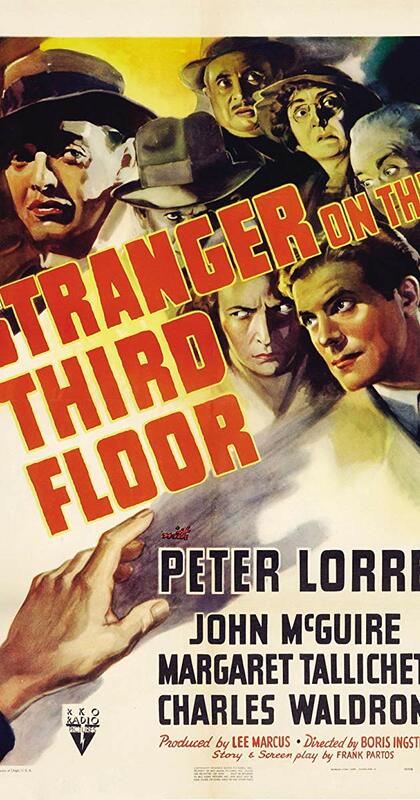 Fans of the film noir genre often cite movies like THE MALTESE FALCON or REBECCA among the first entries in this stylistic category, but a case can certainly be made for STRANGER ON THE THIRD FLOOR, a bizarre B-film made by director Boris Ingster. It features all the elements associated with the dark genre: a big city setting, interior monologues, an extended nightmare sequence, flashbacks, Expressionistic set design… hell, it’s even got noir’s favorite patsy Elisha Cook Jr ! 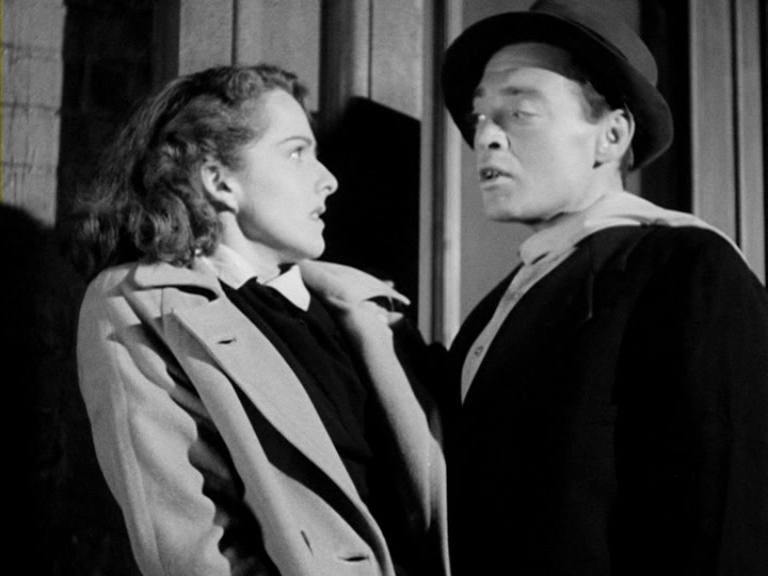 The only thing missing is that downbeat cynicism you find in post-war films, but since America hadn’t yet entered World War II, we can forgive the happy ending and concentrate on what makes this movie the seminal film noir. 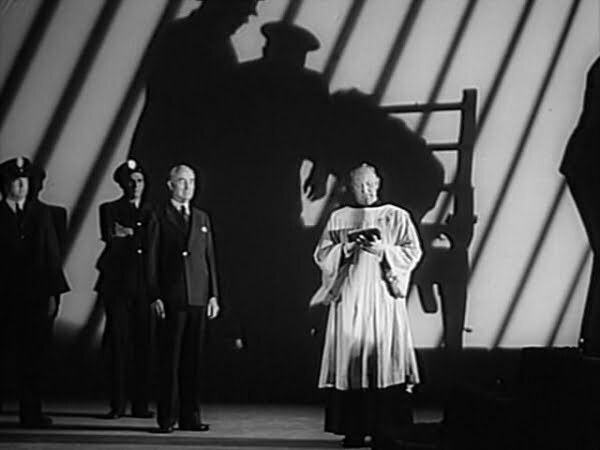 The innovative camerawork is by one of film noir’s masters, DP Nicholas Musuraca, heavily influenced by German Expressionism. Musuraca’s chiaroscuro lighting, drenched in inky shadows, and oddly tilted camera angles help evelvate this low-budget programmer to high art. His work on producer Val Lewton’s 40’s horror films like CAT PEOPLE, THE SEVENTH VICTIM , GHOST SHIP , CURSE OF THE CAT PEOPLE, and BEDLAM set new standards in that genre, and he collaborated with some of film noir’s best directors: Robert Siodmak (THE SPIRAL STAIRCASE), Jacques Tourneur (OUT OF THE PAST ), John Farrow (WHERE DANGER LIVES ), Fritz Lang (CLASH BY NIGHT), Ida Lupino (THE HITCH-HIKER ). RKO’s music maestro Roy Webb provided the score, as he did for MURDER MY SWEET , NOTORIOUS , THE LOCKET, THEY WON’T BELIEVE ME , and those aforementioned Val Lewton chillers. 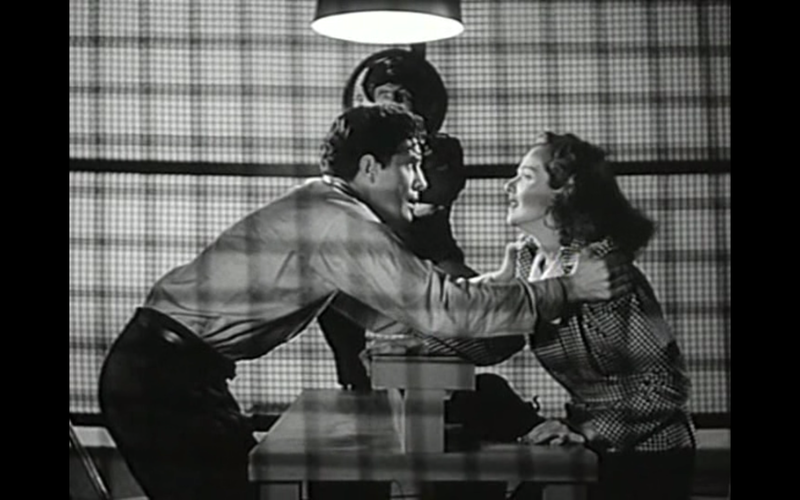 Leads John McGuire (Ward) and Margaret Tallichet (Jane) never rose above the B ranks, but both are more than competent in their parts (Miss Tallichet retired from the screen after marrying director William Wyler). 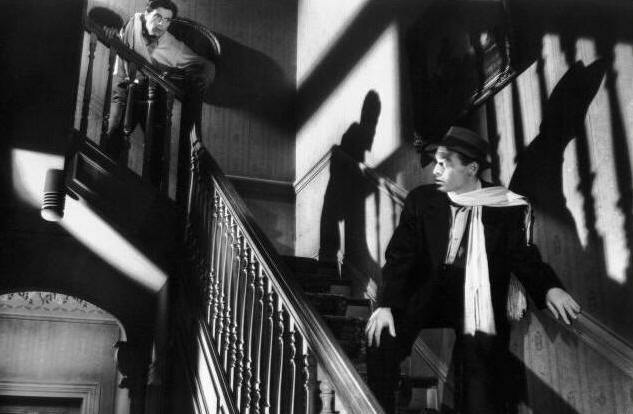 “The Man with the Flowing White Scarf” is none other than Peter Lorre , who is just a shadow throughout most of the film until the very end, where we learn he’s an escaped lunatic. Though his part is small, Lorre’s creepy as hell! Elisha Cook (Briggs) had already been around a few years in small parts; it’s kind of nice to see him as an innocent victim for a change, instead of his usual weaselly punk parts. Sour old Charles Halton plays sour old Mr. Meng, and you’ll spot Familiar Faces Cliff Clark, Donald Kerr, Paul McVey, Oscar O’Shea, and Herb Vigran in small roles. Boris Ingster is somewhat of an enigma to me. Born in 1903, he apparently had worked with Sergei Eisnestein in his native Russia before immigrating to America. Married to German actress Leni Stengel in 1930 (they divorced in 1944), Ingster has but three directing credits – this one, the 1948 comedy THE JUDGE STEPS OUT, and the 1950 low-budget noir SOUTHSIDE 1-1000. He later became a television producer on such series as WAGON TRAIN, CHEYENNE, and most notably THE MAN FROM U.N.C.L.E. Judging his work solely on STRANGER ON THE THIRD FLOOR, I can’t understand why he didn’t have a bigger career as a director. The film moves swiftly, and is full of little touches that would make some big-budget directors green with envy. 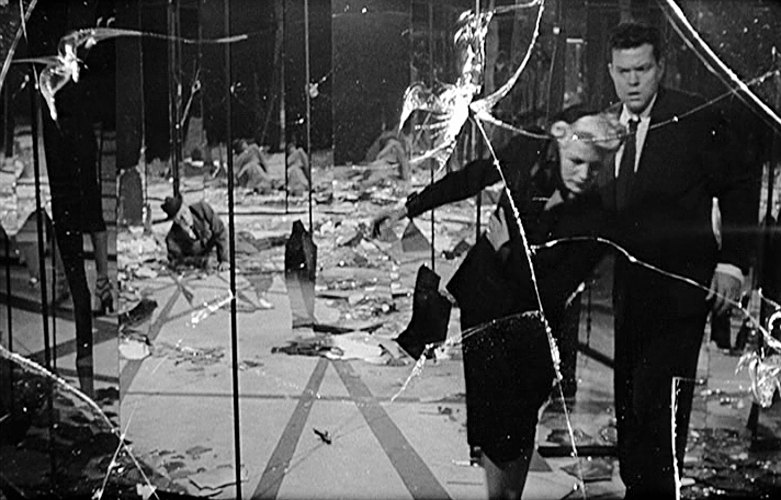 Oh well, I guess we’ll just have to be grateful for this dark gem of a film, the first of the stylistic films noir, and still (despite that happy ending) one of the best. These still shots are so artistic. Makes me want to see the film just for the camera work! Oh yeah, Nick Musuraca was a true artist of cinematography! Great film. It looks stunning visually. Nothing better than some Peter Lorre! Musuraca was a superb cinematographer who enhanced every film he was involved in. Absolutely. One of the best ever. Next PostNext A Thanksgiving Without Turkey? Say It Ain’t So!